A virtual machine (VM) is a high level abstraction on top of the native operating system, that emulates a physical machine. Here, we are talking about process virtual machines and not system virtual machines. A virtual machine enables the same platform to run on multiple operating systems and hardware architectures. The Interpreters for Java and Python can be taken as examples, where the code is compiled into their VM specific bytecode. The same can be seen in the Microsoft .Net architecture, where code is compiled into intermediate language for the CLR (Common Language Runtime). There are basically two main ways to implement a virtual machine: Stack based, and Register based. Examples of stack based VM’s are the Java Virtual Machine, the .Net CLR, and is the widely used method for implementing virtual machines. Examples of register based virtual machines are the Lua VM, and the Dalvik VM (which we will discuss shortly). The difference between the two approaches is in the mechanism used for storing and retrieving operands and their results. Because of the PUSH and POP operations, four lines of instructions is needed to carry out an addition operation. An advantage of the stack based model is that the operands are addressed implicitly by the stack pointer (SP in above image). This means that the Virtual machine does not need to know the operand addresses explicitly, as calling the stack pointer will give (Pop) the next operand. In stack based VM’s, all the arithmetic and logic operations are carried out via Pushing and Popping the operands and results in the stack. As I mentioned earlier, there is no POP or PUSH operations, so the instruction for adding is just one line. But unlike the stack, we need to explicitly mention the addresses of the operands as R1, R2, and R3. The advantage here is that the overhead of pushing to and popping from a stack is non-existent, and instructions in a register based VM execute faster within the instruction dispatch loop. The problem with a register based model is that the average register instruction is larger than an average stack instruction, as we need to specify the operand addresses explicitly. Whereas the instructions for a stack machine is short due to the stack pointer, the respective register machine instructions need to contain operand locations, and results in larger register code compared to stack code. A great blog article I came across (At this link), contains an explanatory and simple C implementation of a register based virtual machine. If implementing virtual machines and interpreters is your main interest, the book by ANTLR creator Terrence Parr titled ‘Language Implementation Patterns: Create your own domain-specific and general programming languages’, might come in very handy. The Dalvik virtual machine is implemented by Google for the Android OS, and functions as the Interpreter for Java code running on Android devices. It is a process virtual machine, whereby the the underlying Linux kernel of the Android OS spawns a new Dalvik VM instance for every process. Each process in Android has its own Dalvik VM instance. This reduces the chances of multi-application failure if one Dalvik VM crashes. 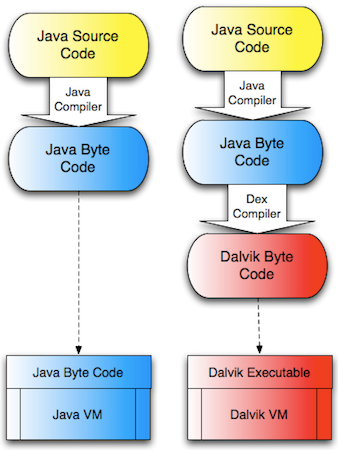 Dalvik implements the register machine model, and unlike standard Java bytecode (which executes 8 bit stack instructions on the stack based JVM), uses a 16 bit instruction set.The registers are implemented in Dalvik as 4 bit fields. The kernel runs the Init program, which is the parent process for all processes in the system. The Init program starts system daemons and the very important ‘Zygote’ service. The Zygote process creates a Dalvik instance which will be the parent Dalvik process for all Dalvik VM instances in the system. The Zygote process also sets up a BSD read socket and listens for incoming requests. 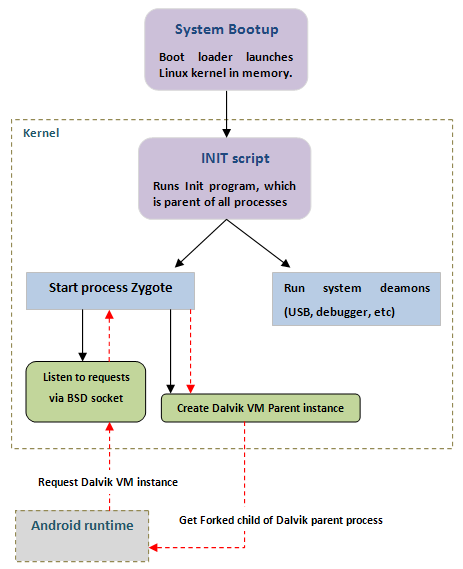 When a new request for a Dalvik VM instance is received, the Zygote process forks the parent Dalvik VM process and sends the child process to the requesting application. This is in essence, how the Dalvik virtual machine is created and used in the Android system. The DEX compiler converts the java .class file into a .dex file, which is of less size and more optimized for the Dalvik VM. There is no clear cut acceptance as to whether stack based virtual machines are better than register based implementations, or vice versa. This is still a subject of ongoing debate, and an interesting research area. There is an interesting research paper where the authors have re-implemented the traditional JVM as a register based VM, and recorded some significant performance gains. Hopefully, I have shown the reader the difference between stack and register based virtual machines, and also explained the Dalvik VM in some detail. Please feel free to provide your feedback or any questions you have regarding this article. Awesome Article………really thank u a lot to share this wonderful article.. Very good and detail info. In a Glance, Pictures narrates the whole thing. Thanks for the comment 🙂 am glad you found the information useful! Thank you Mark. Was a great read. Am glad you liked the post Amit 🙂 Thank you for reading. Thank you for a nice article. One mistake: dex compiler converts .class file(s) to .dex file, not the .java file(s). Thanks Zenth for the observation… 🙂 Have corrected the specific point in the article. Very nice artical and you have cleared my worng ideas about VMs. Thanks Tom… am glad you found the article interesting and useful. Register-based VMs are well known to be superior in throughput. The paper you linked to was pretty definitive on that issue. Stack VMs are only slightly better in program size, and for simplicity of understanding. I rather think that the current VM designers make the mistake of using only single stack system. When I was young I used Forth which had a VM with two stacks. And it was blazingly fast. Excellent article !!! thank you very much. Interesting. But you overlooked something: A true stack based CPU (virtual or hardware) needs at least TWO stacks. Just as register based CPU needs at least TWO register (program counter, stack counter and one data register would count as three). Without they can not be Turing complete. An example would be the VMs for the Forth programming language where a separate data and return stack is used. And once you have two stacks the the disadvantages you mentioned disappear. Are four statements as well. And how does the data get into the register? And how does the result get out of the register? A register based CPU has a very limited amount of register. Currently somewhere between 8 and 16 so you frequently have to move data in and out. A stack, like the one used by the FORTH virtual machine can grow to size of main memory. Therefore you can just leave the results on the stack for far longer time to be used as input for the next operation. Most notably on a stack based CPU you can keep intermediate values on the stack while making a function call. You can’t do that on a register based CPU. Either the caller or the callee need to store and restore the registers somewhere. Usually on the stack. Because most (but not all) register based CPUs have a stack as well. But, speaking about the bytecode, which either machine executes, how are local variables represented.Are they compiled into addresses as actual machines need. or are they provided as an index into registers.For e.g., Parrot provides an arbitrary number of registers which is fixed at compile time per subroutine. smoothly swallowed a mountain…! very well explained! This sounds incorrect. Pop would involve moving data from stack to a CPU register. The time for a pop should be equal to the time for copying a data by memory address. Further, I suspect that further optimizations can be made using a stack based VM rather than a register based vm, due to the fact that the data the operation is working on resides next to each other when using a stack. Finally, the stack is usually stored in the L1, L2 or L3 cache. There are no such guarantees with arbitrary addresses as operands. But I may be incorrect. But it seems weird that Microsoft and Sun chose “inferior” (according to this post it sounds obviously inferior) technology for something so central to their business. I think the reason Android uses a register based VM may be that it allowed them to reuse bigger parts of a compiler toolchain. Also, android is noticeably more sluggish on similar hardware than Windows Phones running .NET. As someone noticed it above you forget about loading values to registers (f.e. mov) which makes register based vm demanding the same amount of steps to add two numbers. Thanks Prasad, glad you found it interesting. Why I see an exactly identical article here? That one is later than this post. p/s just a very small typo in the word “deamons”, for the completeness! Thanks for pointing out 🙂 fixed. Really good article. And still great after 4 years! Very good explanation Mark. Thank you very much. Mark you have explained it in a lay man language with appropriate examples. This was really helpful. Thank you! Can I tell that Windows running c, c++ codes are the system based virtual machines whereas the JVM is process based ? Awesome! Thanks for your simple explanation, like your summarization of several concepts which VM must be included (compilation, stack&IP, virtual CPU, executes). And the reference articles are great too.